Reason for Reading: Received Review Copy from Harper Collins Canada. June was my slowest reading month of the year so far, so I was in need of some inspiration. I stared at my bookshelves and nothing was really calling to me, so I emailed the wonderful Shannon at Harper Collins Canada and simply said "I need something different!" She sent me a few books and this was one of them. It was a lot of fun because I didn't know what I would be receiving. I had originally said no paranormal books, but I was assured this book was different. So, I cracked it open to see and it is in fact different! I decided to review it now because I am way behind on reviews and also because it is a fun read for the R.I.P. Challenge. One of the aspects of young adult fiction that drives me nuts is these girls and guys that are not even done high school being obsessed with each other. They think that there is no one else in the world for them. It really bugs me because they are so young and I don't think it is sending a very good message to the young adults who are reading the book. This book takes this to a whole new level! Jana Webster and Michael Haynes are a high school couple deeply in love. Well, at least Jana thinks so. She has their whole future planned out and thinks that Michael is as in love with her as she is with him. She believes they have the type of love that only with death will they be apart. Then, she dies, and that entirely changes things. This book takes place in the Afterlife. Jana is attending Dead School and missing Michael everyday. Then, she meets Mars Dreamcote. He is the school 'bad boy'. He lurks in the back of the classroom, but Jana finds that she is drawn to him. He has abilities that she finds that she needs, but he also has a warm touch and she is just so cold. She becomes obsessed with becoming a bad girl to his bad boy routine. She believes it is the only way that her and Michael can be together again. This means a lot of bizarre adventures. The thing that really got me is that this a book about a dead girl wishing her boyfriend was still with her and I found it rather entertaining. The book is just so strange, it is good! You just wait until you see everything play out. I think I particularly enjoyed this book because it wasn't about vampires or werwolves. I am getting a bit tired of those two sub-genres. I haven't read a lot of books about ghosts, and when I do, they don't usually act like the ones in this book. I hope you will give this book a read! Thanks to Harper Collins Canada for my copy of this book! Dead School? That alone makes this book sound interesting! Great review, and I've put this on my list to read! I liked this, too. And was thrilled to meet the author. I also liked that while this does have the whole teenage romantic obsession, it also turns it on its head and, just maybe, would give some teens the idea that obsessiveness about another person is not that healthy. You know my first instinct is to say this just isn't my kind of book...but dammit, Kelly, you made it sound downright fun! I seriously might have to get this one. And even if it turns out that I don't like it, I'm pretty sure Annie would. **jenclair: It's an entertaining book! **Anna Adams: It still has obsession, but it handles it a different way. **Debi: It's a fun book. I hope you and Annie enjoy it! 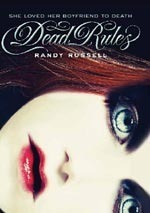 But I definitely want to check out out Dead Rules. Thanks! **Starr: Thanks for the suggestion! I will look into it! **animewookie: I hope she enjoys it! **Skye: Jana is weird, but it is a weird book period... That's why it is fun! This definitely sounds like something that I would love to read. I'm always down for a departure from the norm when reading. **Brie: I wasn't sure if I was going to like it, but I wound up really enjoying it! This does sound good, I like that it takes place in the Afterlife. haha, Mars Dreamcote is a great name. **naida: I know! I love that name! lol It was a fun book and a bit different than the norm, so it was good!